International Comic Con 2017 Preview! It’s happening! Next week once again, for the 16th year in a row (!) I’ll be peddling my wares at the International Comic Con! 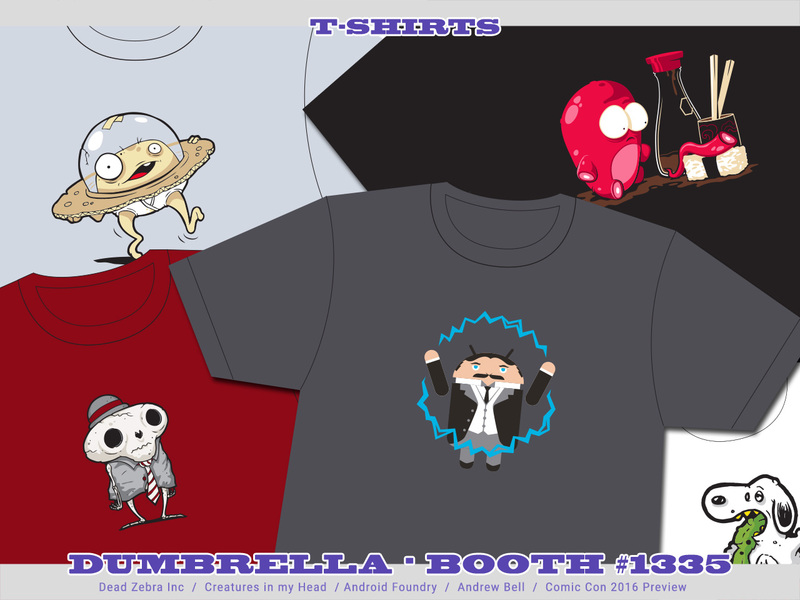 Find me along with my dumb pal R Stevens AND special guests Cards Against Humanity at “Dumbrella” booth #1335 July 19th-23rd. We’ll have tons of great stuff, including but not limited to my goodies below! As usual there will be a wide selection of those full color high quality adhesive party slappers that some people call “stickers”! Pick one up for a buck, or get 5 for only $4! 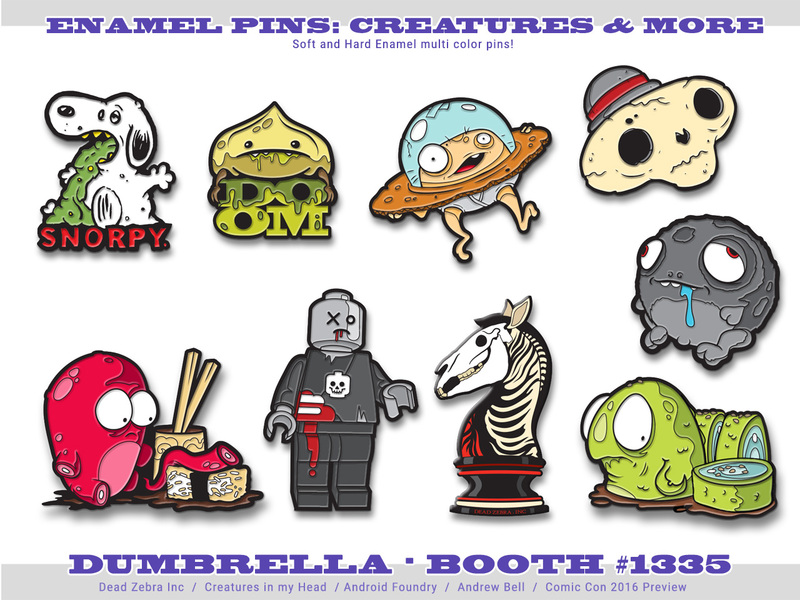 What’s a Comic-Con without ENAMEL PINS? Am I right? Not to let anyone down, I’ll have over 25 pin designs available including the all new Pet Food, Golden Last Knight and the return of the sold out Morimoth, now in silver. $8-10 each depending on how many you prick up! Summer means two things, Comic-Con and watermelon.. in that order. 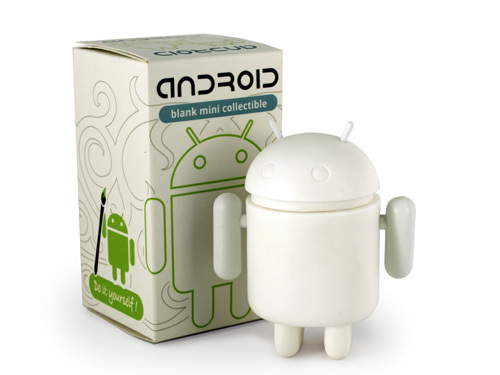 Satisfy your summer cravings with the sweet new Android Mini Collectible special edition Summer 2017 release! Featuring a translucent faded melon body and rind head, we’ll have limited quantities on (sticky) hand for $10 each. Going to Comic-Con for books filled with comic drawings?.. That’s crazy talk, but I guess I’ll bring a few of those anyway. I’ll even draw in them for you, I think that’s still allowed at Comic-Con? Yo, new Android. Who Dis? Introducing a new member of the Android figure family, Andy! This 4″ vinyl figure features cute lumpy lines with articulated arms and head, each figure includes a sticker sheet of emojis to decorate a tiny phone accessory! Limited quantity preview release, $12 each. Dress yourself! A couple of new shirts sure to impress friends, coworkers and bystanders alike. Transform into bat man, dig into some sushi, or get your code on with these three designs. $20 each or 3 for $54.. or something like that! I’ll have only one each of Midnight (black) and Memories Lost (bronze) moth sculptures available for $150 and $250 respectively. I’ll also have a few new Pet Food resin casts, each one personally hand cast and painted for only $80 each! Prints! We’ll have the usual lineup of Never Look Back sushi themed prints, along with a selection of our Android Foundry propaganda themed prints and the new office/cubicle friendly mini print sets! Prices vary. And of course we’ll have some more toys, including the new Glow in the Dark Last Knight edition, O-No Sushi sets, Karoshi-San, Androids and more! We’ll also have mugs, socks, bags and other things, too many to list here, see you next week! International Comic Con 2016 Preview! It’s that time of year again, in just over a week I set up shop in San Diego at the 2016 International Comic Con! 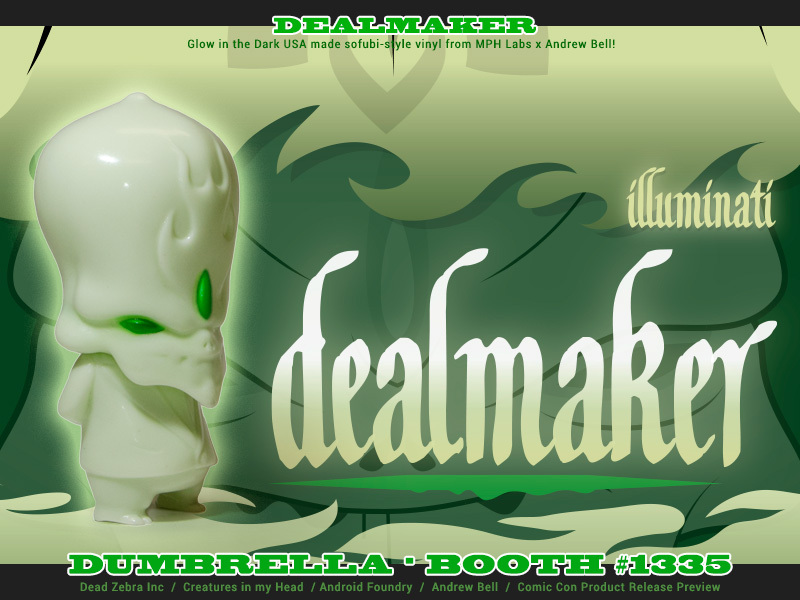 Find me along with my dumb pal R Stevens, at “Dumbrella” booth #1335 July 20th-24th. We’ll have all this and much more! Karoshi San: Area 51 Edition! 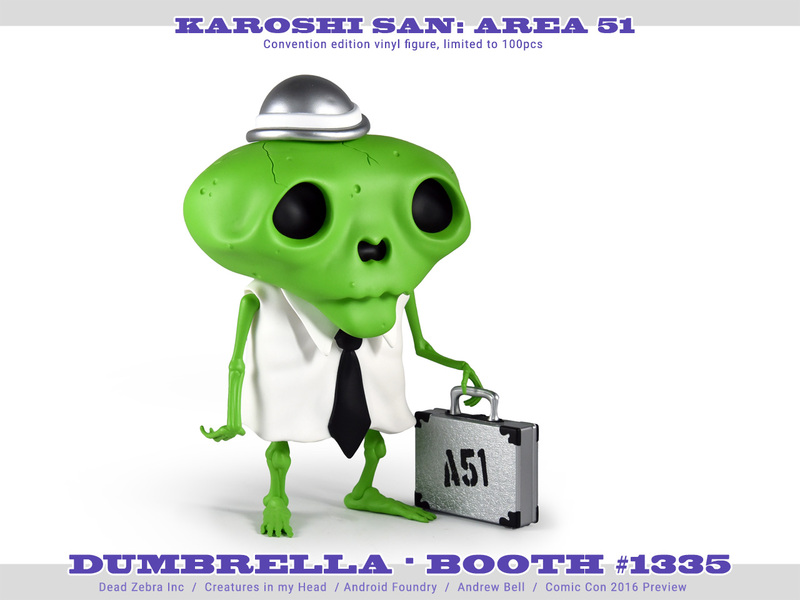 Limited to only 100pcs each with a numbered certificate, this 7″ tall green government lab escapee can only be spotted at conventions (where he can walk freely and people just assume he’s in costume). Limited quantity available, $65. I heard you guys liked pins.. so I finally made some pins! I’ve got a whole lineup of brand new soft and hard enamel pins including O-No Sushi, Worrible, Dumpling of Doom and more! Each is packed on a backer card, available for $10 each with bundle deals extra savings! Oh and of course I made some Android pins featuring some classic designs to go along with those! 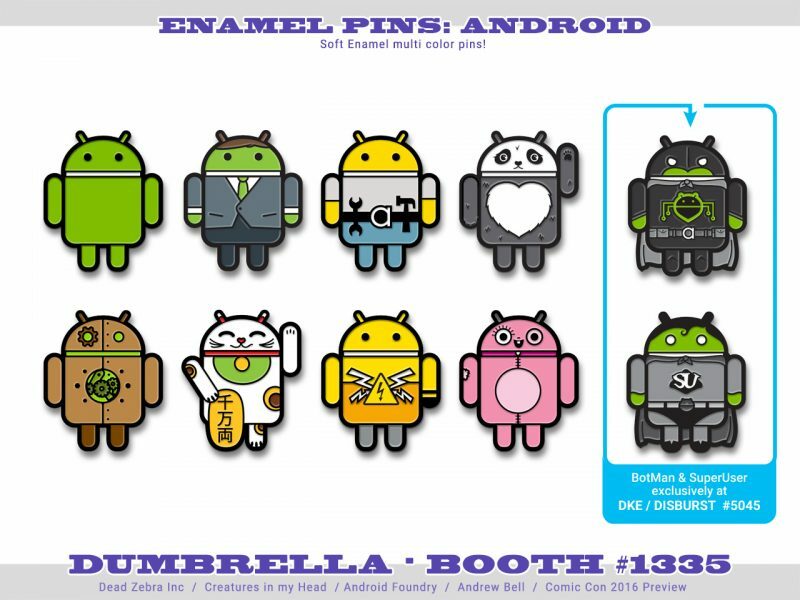 Standard Green, Buisness Man, Construction, Panda, Copperbot, Lucky Cat, Hi-Voltage and Pinkey are all available at our booth #1335, and stop by our distributor booth at DISBURST / DKE #5045 to find BotMan and SuperUser! Speaking of Androids.. 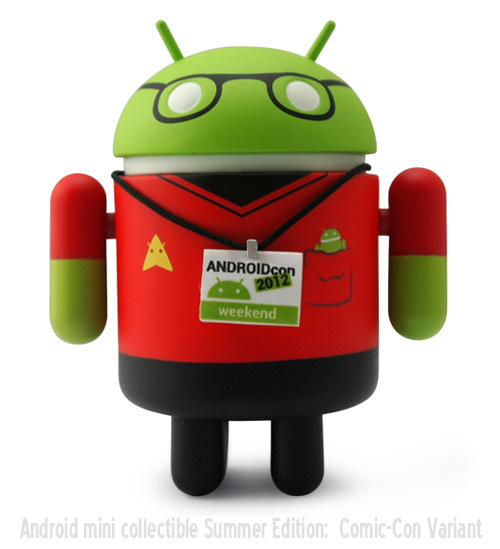 Visitors to #1335 get first look at and first crack at, Android Mini Collectible Series 06! We’ll have a few cases on hand for those lucky attendees to pick up early, with the series appearing at retailers starting in August. 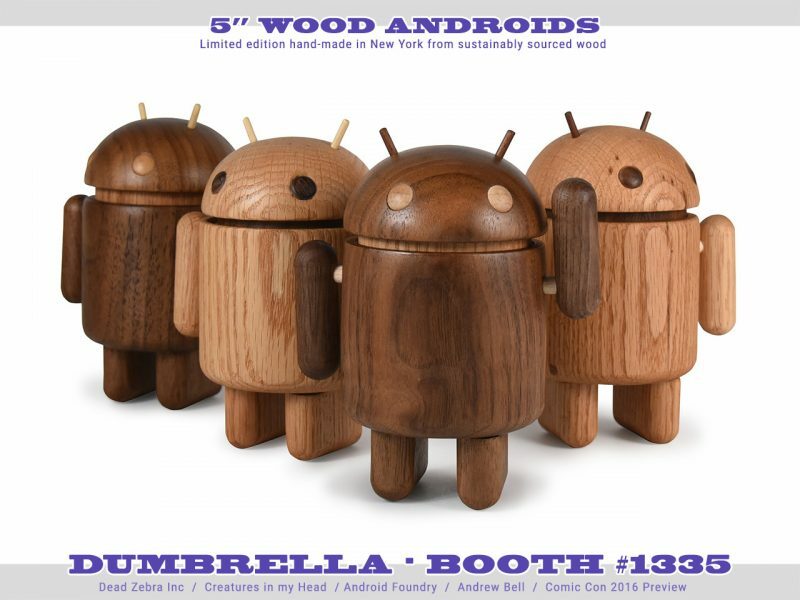 I’m happy to announce that we’ll have some of these beautiful 5″ hand-made solid wood Androids available to the public for the first time ever! Started in 2012 as a collaboration with Noli-Noli Handmade, these were previously only available as Google Executive gifts and impossible for the average collector to come by. I’ll have a post dedicated to these guys tomorrow! Available for $120 each, packed in a muslin bag and custom kraft box, very limited quantities. 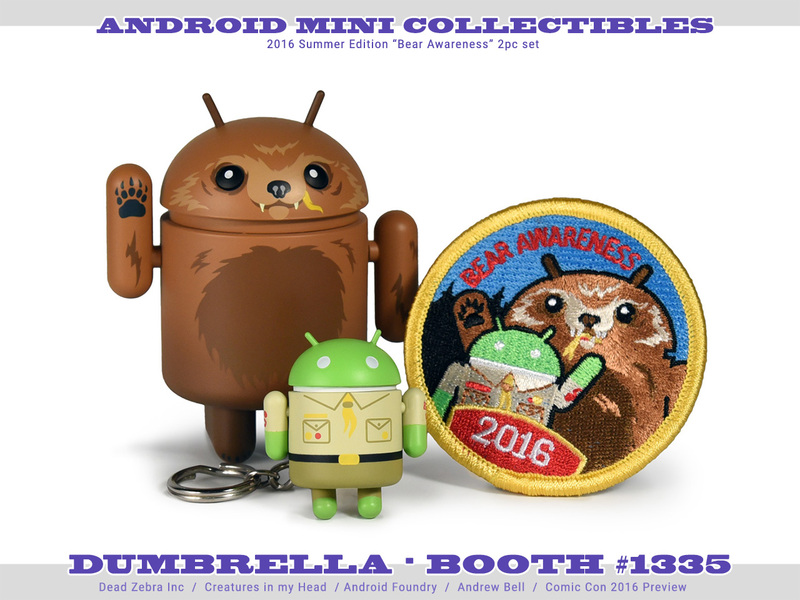 Stay aware and earn your special embroidered badge with the Summer 2016 edition “Bear Awareness” Android Mini Collectible also making its debut at Comic-Con!, this 3″ figure and 1.5″ keychain pair comes in a custom window box for $15 a set! Some new shirts to cover your body with! Believe again with an adorably ugly UFO creature, control electricity with the new Tesla T, get to work with Karoshi San, sample some sushi with Lunch Special.. or maybe even piss off some peanuts fans with Snorpy! Come by and check out our selection, sizes and styles limited, $20 each. 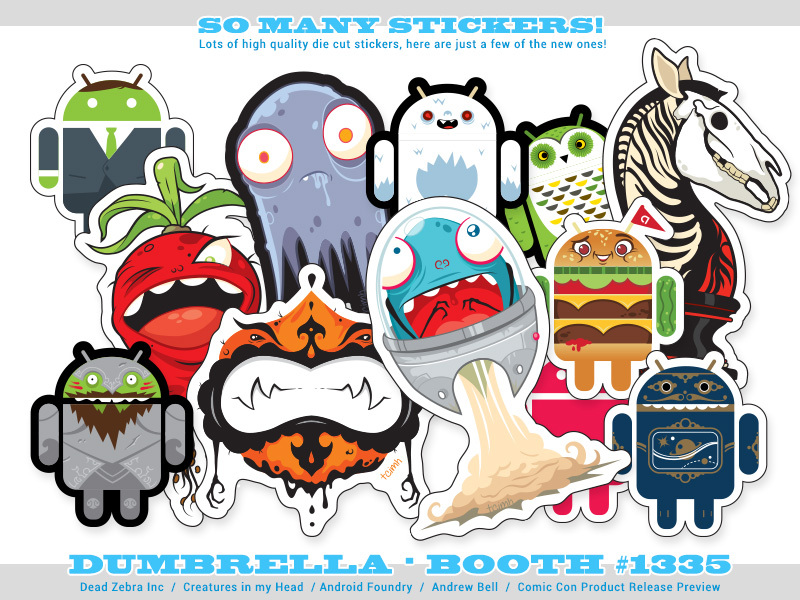 Some new stickers to cover your body with.. or whatever you want to do with them. Oh so many stickers. Full color die-cut vinyl goodness to slap on your laptops, notebooks, guitar cases, windows, cars, pets, grandparents, etc.. $1 each. What is Comic-Con without having some sort of comic? 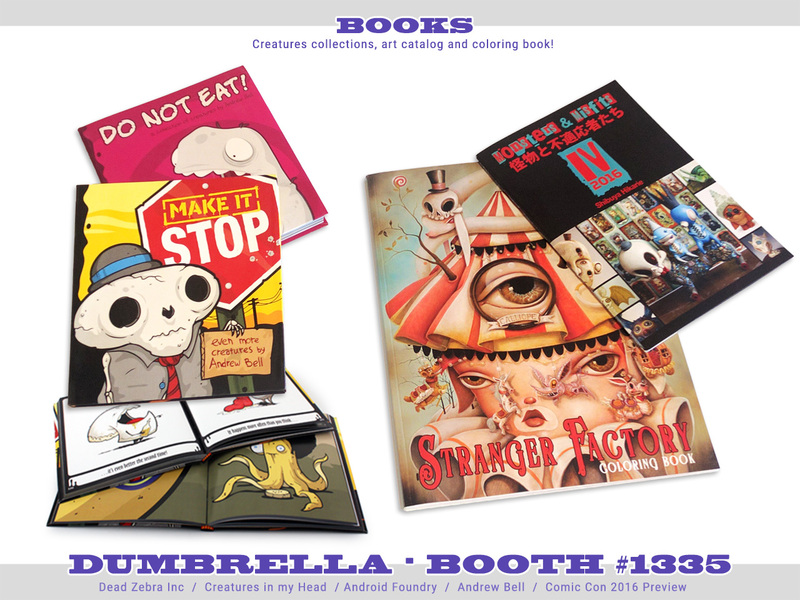 Unfortunately it’s still Comic-Con… but luckily I’ll have copies of Make it Stop and Do Not Eat available to sign, along with a few copies of the new Stranger Factory Coloring Book, and our Monsters & Misfits IV exhibition catalog! Prices vary. There will be a selection of toys and collections including Karoshi San, the Last Knight, Android collectibles, Worribles and more! Prices vary from $7-75, so stop by and see what’s available! We’ll also have mugs, socks, bags and more. Too many things to list here, but this should at least give you an idea and help you plan. Looking forward to seeing all your faces, both old and new. International Comic Con 2015 Preview! 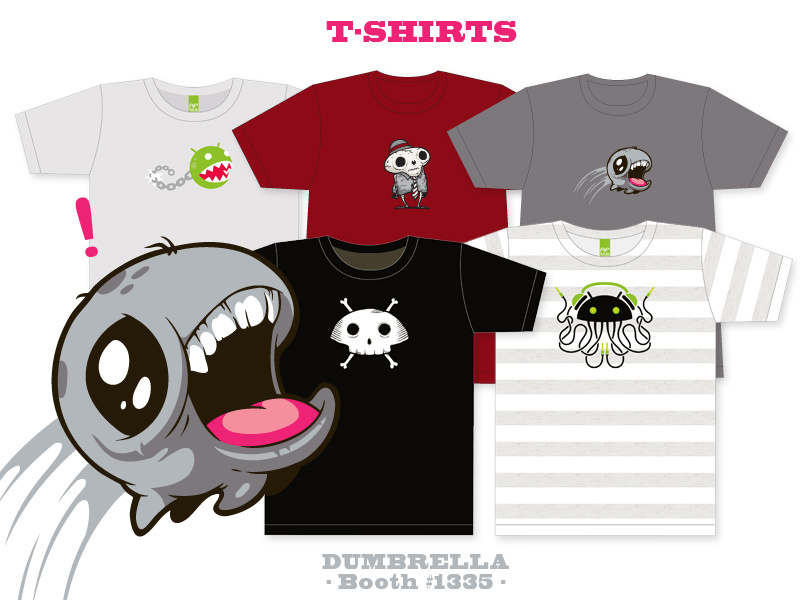 Stop by the Dumbrella booth (#1335, 1337) at the International Comic Con this July 8th-12th for the good stuff! I’ll be there along with my Dumb pals R Stevens, Jon Rosenberg and puzzle master Chris Yates! Finally! A new collection of creatures featuring a menagerie of monsters from 2008-2015. This new book clocks in at 144 pages, and has the same size flexi-cover as the Do Not Eat collection. Make It Stop will be available for $12, or bundled with Do Not Eat for a discount! Available from fine retailers and the Dead Zebra Shop later this summer. 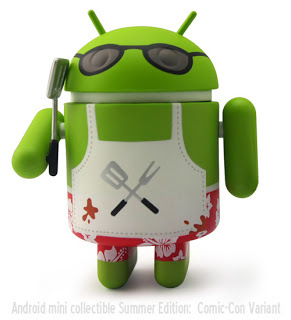 No summer is complete without a trip to the beach.. or a summer edition Android! This year we feature a two pack of a sunburnt lifeguard (with tiny whistle) and a swimming prankster (complete with fake shark fin!). We’re gonna need a bigger shelf! This set will be available for $20. New shirt designs include ‘Hello World’ and the simple but adorable ‘Panda’ along with some popular classics such as ‘Astronomiton’, ‘Tagged’ and ‘Karoshi San’! Available in S-2XL with some in women’s cuts as well for $20 each or $17 each if you buy 3 or more. You asked for it.. several hundred times over the last three years.. the Never Look Back series continues with a rather uneasy eel. Available for $10 each or in a full set of 4 for $30. 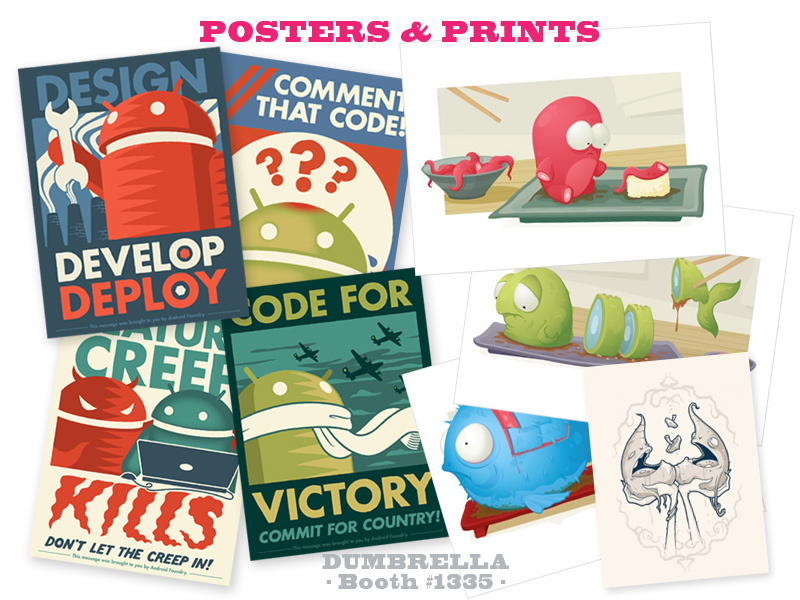 We’re also bringing along some Android Foundry Propaganda posters and a creatures print or two! 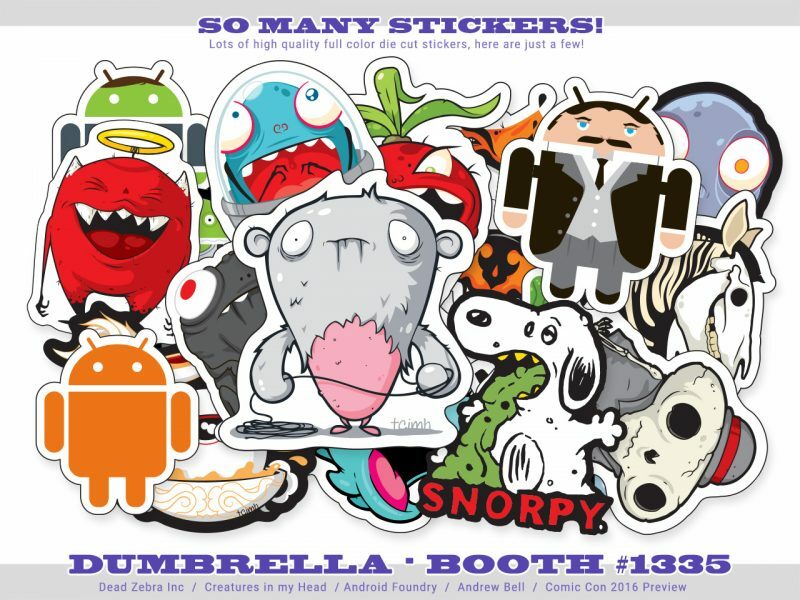 As always we have lots of full color high quality die cut stickers, including new Creatures, summer Androids, Glop, Karoshi and more! We’ll have an assortment of toys on offer from Last Knight and Worrible to Android Series 05 and O-No Sashimi, many at below usual retail prices.. oh and perhaps One More Thing™…. International Comic Con 2014 Preview! Here’s a sneak peek at just a few of the items that will be exclusive to, debuting at, or otherwise available from myself and my collaborative partners at the 2014 International Comic Con in San Diego this July 23-28th! 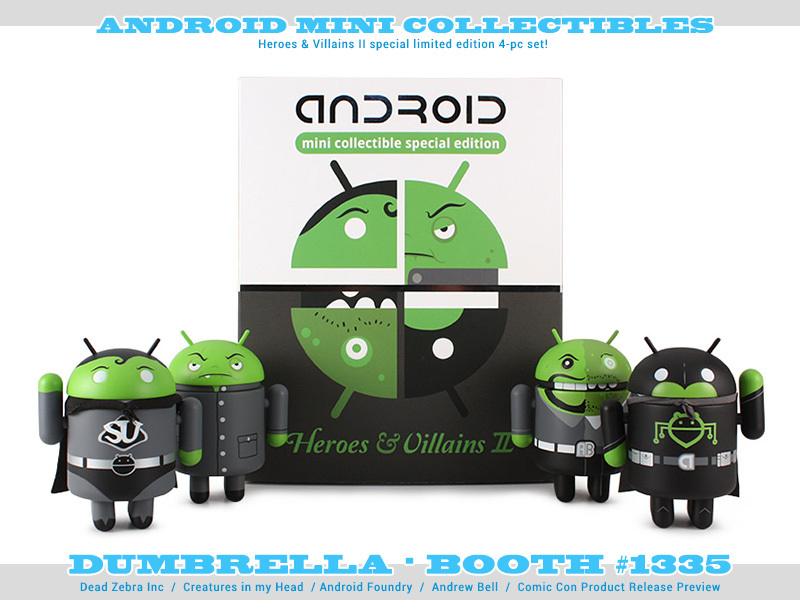 We’ll have a whole bunch of Android stuff, but the real star of the show is the Android Mini Collectibles Heroes & Villains II set! The set will be available starting Preview Night with limited supplies available each day. $40, limited to 2 sets per person. We’ve got a ton of new full color high quality die cut stickers, including new Creatures, a Last Knight, Androids, and more! $1 each or $4 for 5! 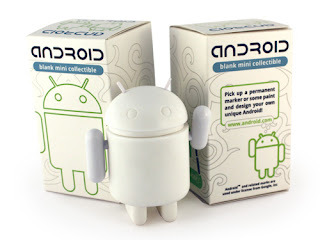 Android Set B includes 10 mini Androids for $8. We’ll also have a few huge Android wall stickers on hand! New shirt designs include super soft discharge printed Dead Zebra ‘Tagged’ and the oft requested O-No Sushi ‘Lunch Special’! We’ve also got an Android ‘Astronomiton’ with metallic ink on navy, and a drippy Orange Dropper monster on silver. Available in S-2XL for $20 each or $17 each if you buy 3 or more. a new Dealmaker! This sofubi-style USA made vinyl figure is back with a ghostly glow! Glow in the Dark ‘illuminati’ edition will be available for $35 each. Over at our distribution partner, DKE Toys, you’ll find the finally finished Infected Android sculptures! They’ll have these hand-cast resin sculptures by Scott Wilkowski x Android Foundry in four different deadly colors for $70 each. Only at DKE Toys (#5045)! Last but not least.. Last Knight is back! Following the incredible release of the original edition (thanks!) 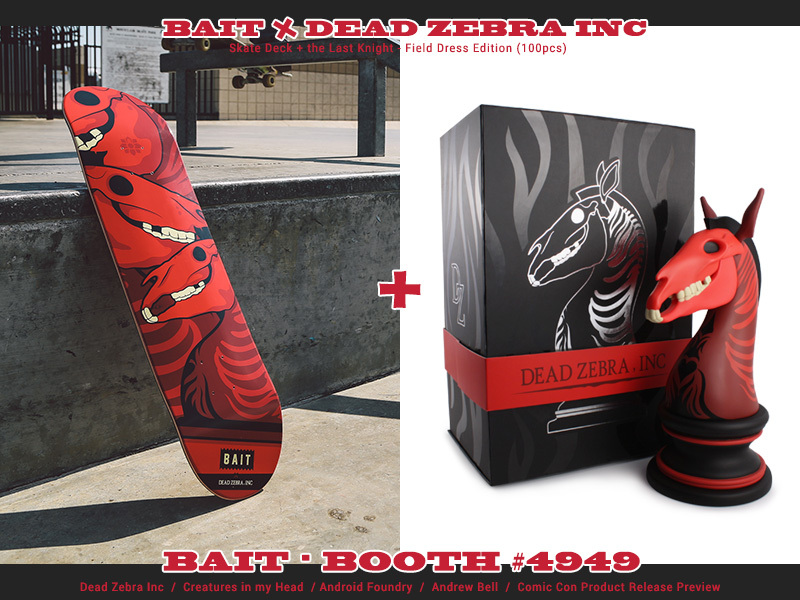 we’ve teamed up with BAIT to bring you the really limited and really red ‘Field Dress’ edition and skateboard! The figure is hand numbered in an edition of only 100 pieces, slated to be available for $75 or for only $100 with the matching skate deck. Only at BAIT (#4949)! Hope to see some of you there! 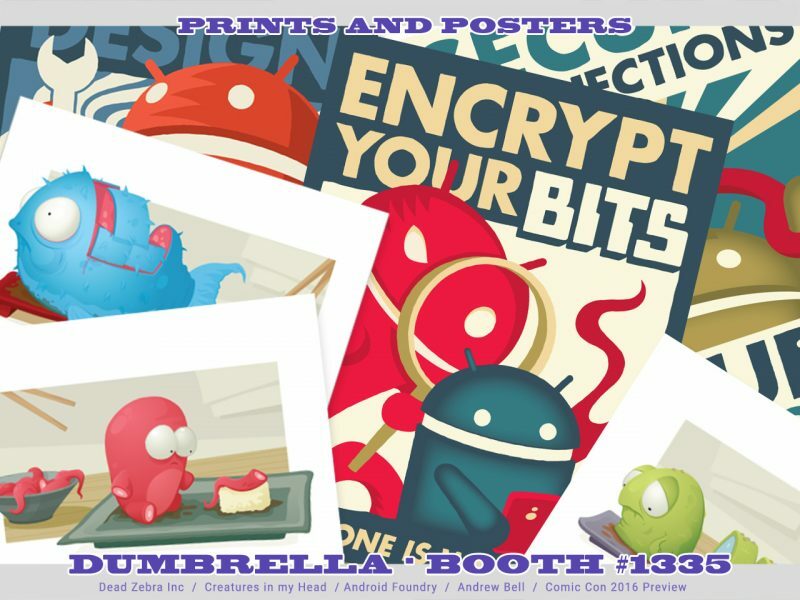 As usual I’ll be spending most of my time at Dumbrella, Booth #1335, so come on by and say hello and support the arts by picking up an item or 10! 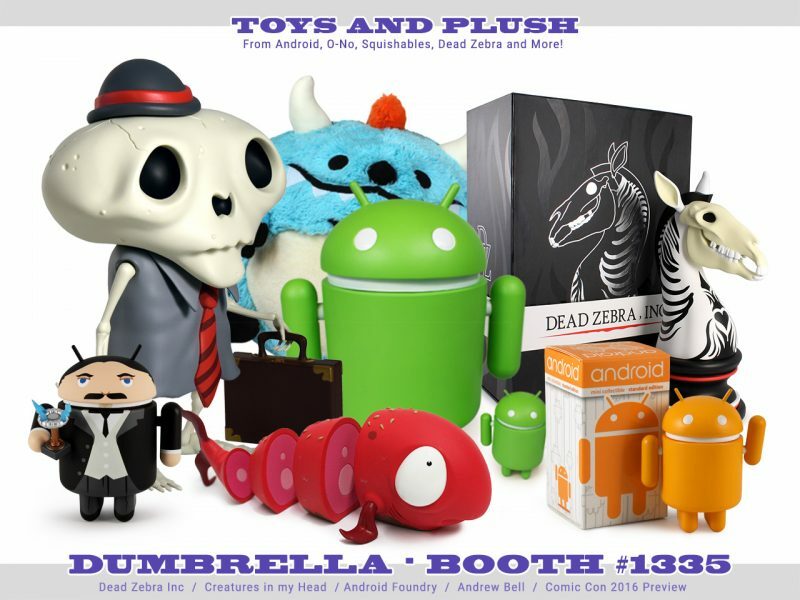 DZ / Andrew Bell / Creatures in my Head SDCC 2013 Rundown! It’s that time of year again! Comic Con time! 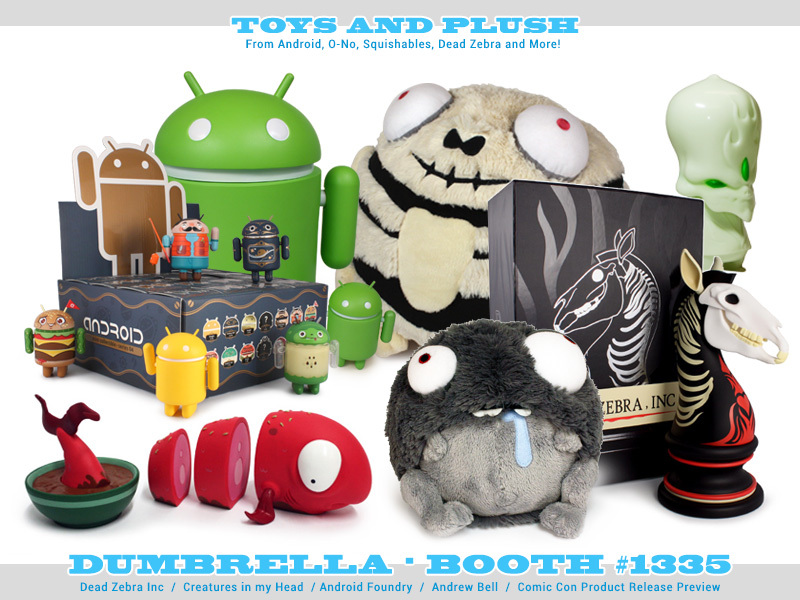 Be sure to stop by Dumbrella, booth #1335 to check out the goodies from me and my pals! 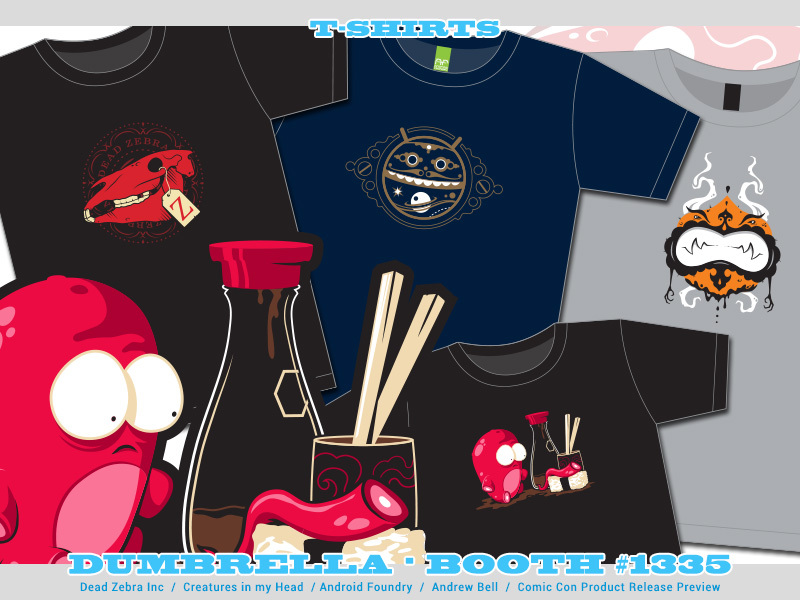 New shirts including Android Jolly Roger, JellyPhones and a creature we’ve lovingly dubbed Snot Rocket here in the studio. 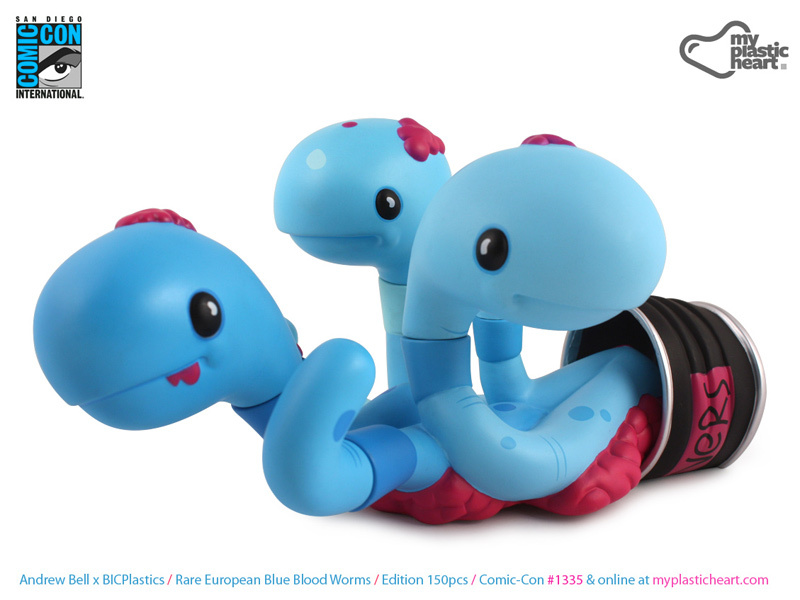 I’ll be debuting the “Clear Envy” edition Dealmaker sofubi and the blue edition of Can of Worms! Also a few squishy items, and a selection of Android goodies including the new Rainbow sets, Big Box edition, Lucky Cats and more! I’ve got a bunch of new high quality die cut silkscreen stickers ready for you to vandalize decorate with! A few of the new Android Foundry Progress Administration developer propaganda posters will be in the house, along with the delicious assortment of other prints including the Never Look Back series. I’m also excited to show off the debut of a Scott Wilkowski x Android Foundry collaboration, INFECTED ANDROID. A different color clear cast resin abomination will be available at DKE Toys #5045 Thursday through Sunday! I will be signing along with Scott at 12 noon on Saturday, July 20th at DKE. Finally a brand new edition of the Dealmaker sofubi style vinyl figure made entirely in the USA. The transluscent green “Clear Envy” edition comes bagged and carded. Limited quantites available daily at #1335, $35 each. Grab your red shirt, pick up a lanyard and fire up the grill, summer is here and that means two things.. BBQs and Convention Season! DKE Toys just announced these on their blog , so I suppose I can mention them as well! 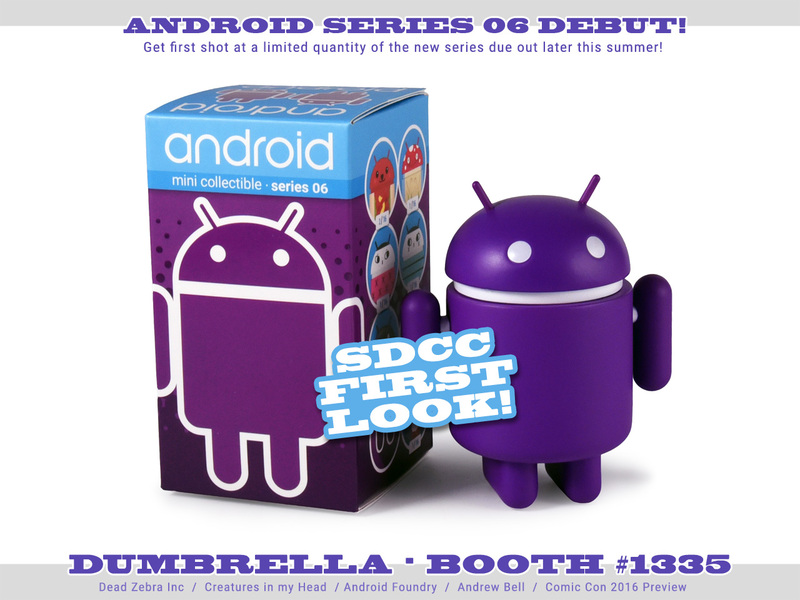 Android mini collectibles Summer Edition: Comic-Con Variant is coming to San Diego this July! Limited to 1,000 sets. 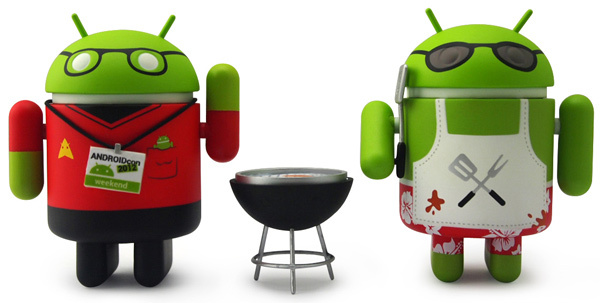 Includes Fandroid with lanyard and badge and Griller with spatula and grill accessory. Both come packed in a special dual window box for $25 (CA tax included). They’ll be available at DKE, booth #4728 from July 11-15th at the International Comic-Con. If you love red but missed out on the super limited Singapore edition, you’ll be happy to hear that the regular Red Snapper edition will be arriving soon! A small number of these are set to debut at this years New York Comic Con, Dumbrella booth #788, and will be available at toy and specialty retailers both online and in the real world shortly thereafter! Once again the international comic-con in San Diego is almost upon us! You know what that means, a solid week of pain and suffering fun new stuff! O-No Sashimi (based on the popular Never Look Back II print) makes its delicious vinyl debut at the show, complete with blue special edition. I know the show sold out very early this year, and a lot of people can’t make it, so we’ll be holding a number of these for online sales in the dead zebra shop! We’ll also be serving up a few of the standard Green editions, these will be hitting toy and specialty shops worldwide shortly after the convention. The standard edition will retail for around $35 US and includes all delicious fish bits, two sets of eyes and a bowl in a supermarket fresh display tray! The blue edition is limited to 250pcs and will retail for $40 US. Here is O-No Sashimi compared in size to the original O-No Sushi! A few more pics are up on Flickr! Nom nom nom..
We first previewed the painted master resin sculpt of O-No Sashimi in San Diego last summer at International Comic Con… then we got a little distracted by some Androids! Well, we’re back on track, and these guys are set to be swimming(?) over the ocean soon. Currently scheduled for a 2011 International Comic Con debut along with a special edition perhaps? Can’t make it to San Diego this year? We’ll have some fresh green fish online and in shops as well! Do-It-Yourself Androids coming soon / SDCC update! 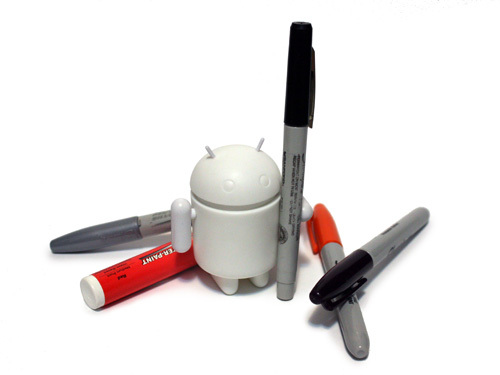 We take a break from our regularly scheduled production party to bring word that pure white blank Do-It-Yourself Androids will be coming soon! We’ll be bringing a small number of them to the International Comic-Con this week, along with several cases of Series 1. Blanks will be available for $6 each, with Series 1 at $7 and cases at $110, we will be limiting the number of sales each day to give more attendees a chance! Can’t make it to Comic-Con? D-I-Y and Series 1 will be available again online shortly after our return from sunny California! We will be doing some shop beta testing sales the last week of July, and hope to be open for business the first week of August. Want to help beta test the shop and guarantee yourself some sweet vinyl love? Leave a comment with your e-mail address and country (it will not be published to the public) and we will randomly select participants from those comments! 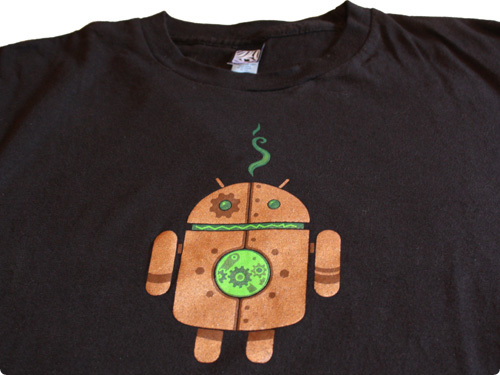 Copperbot Android t-shirts! With metallic copper ink! Available at the booth for $20 (or $17 in a 3 pack with other shirts), and available online along with the toys once the shop relaunches!